I should clarify: the publisher didn’t give me the game. Rather, the publisher gave a review copy of the game to another reviewer, who decided it wasn’t his thing, because it wasn’t an adventure game. So he gave it to me. Note the lack of venture capital. Of particular interest to me was that the game allows you to play in five regions around the world, one of which is Pittsburgh, PA. Having spent the past several years working for a high-tech startup in Pittsburgh, PA, I couldn’t decide if the prospect of playing a game simulating working for a high-tech startup in Pittsburgh, PA filled me with elation or dread. (“Troll for resumes at Geek Night. Lose 1 turn!“) But, obviously, I had to try it. The game was not at all what I expected. It’s quite good, and not a little bit strange. On the surface, the game looks like Sim City. You’re given an isometric view of your chosen starting city in the mid-1800s. 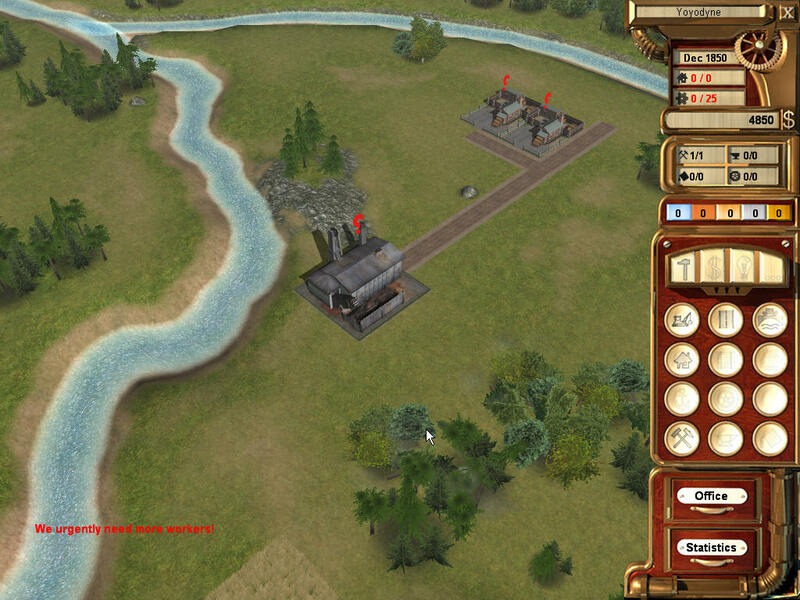 The main effect the starting city has is to define the topology around which you can build your company’s structures. The early part of the game revolves around building a power plant a factory (or factories), and housing for your workers. All structures must be connected by roads. Over time, you’ll need to provide fire stations, water towers, and other Sim City-like services to keep things running smoothly. When all is going well, your factories produce goods (initially, bicycles), and you earn a little money to reinvest in the company. This part of the game, however, is fairly shallow, and there really aren’t many strategic decisions to be made. Where things get interesting is that every so often, an icon will appear above a building, and clicking on the icon brings up a problem to be solved. The problems tend to layer on top of each other in an intuitive way, and in a way that makes for interesting reading. For example, early in the game you might learn that the factory needs to store some goods in the second floor. To accomplish this, you might be shown a selection of different types of pulleys, and asked which one will provide the greatest lifting power. Pass this problem, and in a little while the foreman will be back asking you to calculate what length of rope is needed to lift a certain amount of material. A reference library – in the form of a number of science magazines, and letters exchanged with famous scientists – are always available from within the problems to help you solve the challenges. If you solve the “quizzes,” you earn money and other rewards. Failing to solve most problems simply results in failure to progress, and you can retry the problem later. In some cases, choosing the wrong answer can result in a penalty being assessed. The problems start off simple, but escalate in difficulty at a fairly steady pace. It was around the point that the game started asking me to calculate the average rate of acceleration of a piston with a displacement of 10 centimeters that rises and falls 50 times per second that I started to sweat. I’m loathe to classify Geniu$ as an “educational” game, because that seems to me to be shuttering it into a box full to the brim with thoroughly unfun games. There’s the odd exception of course (can I count the wink-wink-nudge- nudge section of Sam and Max Hit the Road where the lead characters were serenaded by talking heads reciting the history of famed naturalist John Muir, and a sign descends from the ceiling, blinking “EDU-TAINMENT”?) but on the whole, educational games are to games what tofurkey is to food. Geniu$ is an exception. I kept (and keep) playing it not because it is “educational,” but because it is fun and challenging. On that axis, at least, the game is a great success. There are a few minor complaints I have about the game, mostly centering around user interface. There is no notepad in the game, and no calculator. Particularly when answering the “quizzes”, you are faced with problems that require a little bit of math, and it would be convenient to have a place to jot down notes and do simple calculations. “Why not just use the Windows calculator,” you ask, and the answer is that the game doesn’t play nicely with alt-tab. Eventually, I gave up and just brought a pen and pad of paper to the computer with me. This is somewhat irritating (not to mention messy). 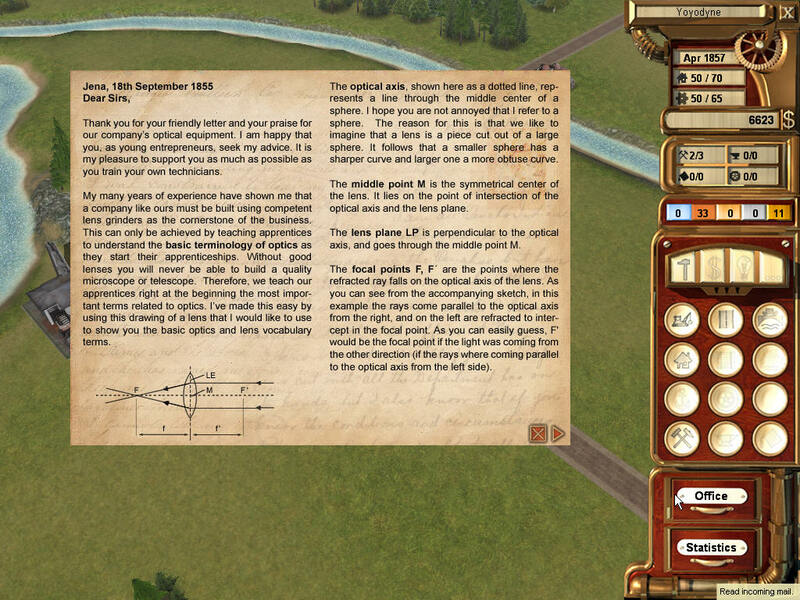 Second, the game is clearly a German product – if you learned your science history from this game, you would conclude that every technological advance from 1850 to 1900 came from Bavaria – and some localization bugs slipped through. The great majority of the game was translated correctly, but a few mistranslations occur in some of the challenge questions, which is exactly the worst place for them to appear. These problems are, overall, just quibbles. 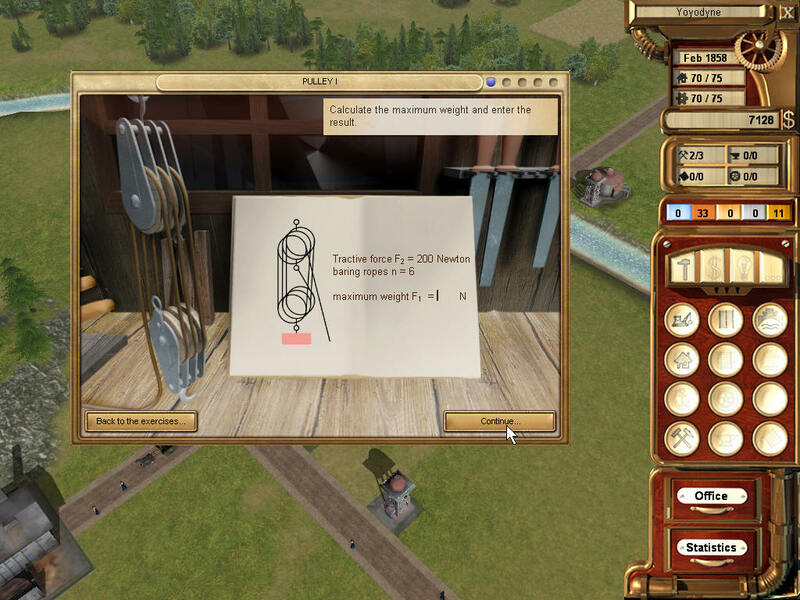 The game is fun, and manages to put physics questions in a practical context that is believable and interesting. If you aren’t frightened of doing a little simple math, and you have a Windows box, $30, and a pencil and notepad, consider trying Genius out. Just remember not to blow all of your seed money on sushi and pinball machines.